As the days get warmer, more and and more people are out sprucing up their lawns. After cleaning up winter debris, one of the first tasks people like to do is refresh the mulch around their trees and shrubs. Garden centers and hardware stores know this and stock up on piles and piles of bagged mulch. Mulch serves many purposes but the two most common reasons for mulching lawn trees are the decorative appeal and protecting trees from mower damage. One of the most common ailments of yard trees is “lawn mower disease”. This happens most often when someone mowing the lawn gets in a hurry and tries to get too close to a tree. The mowing machine then makes contact with the trunk of a tree and scrapes away part of the bark. The wound leaves an entry point for insects and disease organisms to enter an otherwise healthy tree. Many times the owner is not even aware that his machine caused the damage. When a tree is surrounded by mulch, you’re less tempted to mow close to the tree trunk. Well-place mulch can give your lawn a crisp, manicured look. Unfortunately, many people see commercial landscapes with trees poorly mulched by unskilled workers and try to copy that look at home. The look I’m referring to is “volcano mulching”. I think you know what I’m talking about. That’s where mulch is piled up against a tree trunk in a volcano shape. They assume that is the proper way to mulch since professionals are doing the work. Many homeowners have come to prefer that volcano look. I have had people actually get angry with me when I suggested they change their mulching technique. Over time, volcano mulching damages the bark and the tree eventually struggles to stay healthy or slowly dies. The proper way to mulch is to apply and maintain no more than two to four inches of mulch in a four to five foot diameter around the tree. Do your tree a huge favor and say “no!” to volcano mulching. You’ll need two basic tools. Use a sharp pair of pruning shears for twigs and small branches. Loppers resemble over-sized pruning shears. They are much more sturdy than shears, have longer handles and are used for for cutting larger branches. 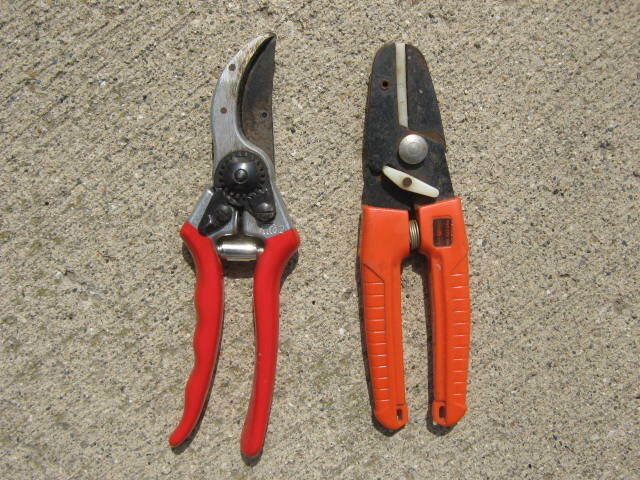 By-pass type pruners (left) make the cleanest cuts. Anvil type pruners are cheaper to buy but don’t cut as well. May 10 is probably already marked on your calender. That’s because it’s Mother’s Day and by default, Mother’s day is always shown on all calenders. However, there is another reason to mark that day. 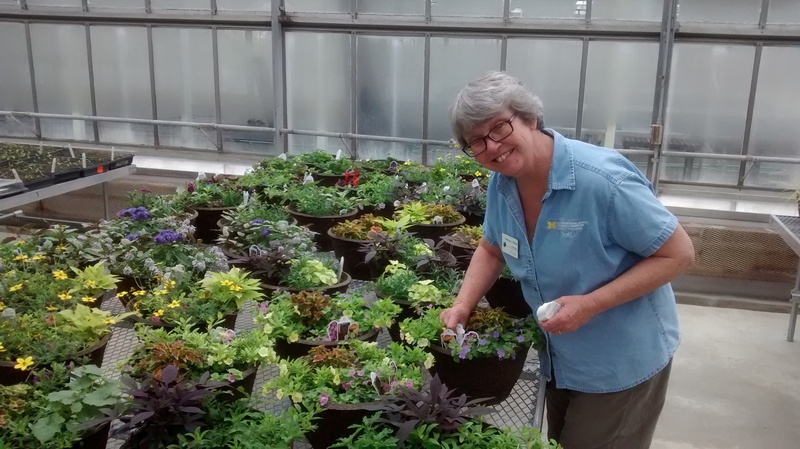 It is weekend of the annual Spring Plant Sale that happens at University of Michigan Matthaei Botanical Gardens in Ann Arbor. This week I had a chance to go behind the scenes and got to see how preparations were coming along for the Spring Plant sale. The day I was there, staff and volunteers were tending thousands of growing plants. They were also designing and planting many, many hanging baskets and containers for the fund raiser. Adrienne O’Brien Collections and Natural Areas Specialist at Matthaei Botanical Gardens leads a team of University of Michigan student workers and adult volunteers. They plant, grow and design containers for the Plant Sale. Make plans now to take Mom on a trip to the Gardens on Mother’s Day. See you out there.